When life gives you carp, think to the East; it’s a prized fish in Asia. Even so, carp are normally thought of as trash fish, dirty, muddy and bony — and they can be all of these things. But if you catch one in clean water, they will not taste muddy at all. Carp is farmed all over the world, and indeed was brought to the United States as a food fish by the Germans in the 1800s. It is cheap, and, when properly farmed, firmer and cleaner-tasting than tilapia. It’s often cheaper, too. But, there is one thing you will need to get used to: Bones. Carp have an extra set of bones you will need to deal with. In Asian cultures, they are not so frightened of a few bones — besides, eating with chopsticks makes it easy to pick around them. The technique I am using here goes a long way to thwarting the bones. You need to slice the carp to the backbone every 1/4 inch or so, which cuts the little bones and opens them up to the hot oil. It’s the hot oil that softens the bones to the point where you can barely notice them. This technique works really well with pike and shad, too. Keep in mind there is no reason you need to use carp here; it's just that carp is traditional. Any small fish that can fit in a wok will do: Rock cod, bluegills, smallmouth bass, white bass, black seabass, porgies, spot, croaker -- you get the point. Any fish that's a little too small to properly fillet works. Prepare the fish. Cut off the fins of each fish with kitchen shears or scissors. Remove the gills of the fish if they are still attached by cutting them out with the kitchen shears. Make vertical slices along each side of the fish evenly spaced along its length, about 1/4 inch apart from each other -- this is very important, because carp have an extra set of bones you need to cut. Doing this shortens the bones and opens them up to the hot oil, which softens them enough to eat. Rinse the fish under cold water and pat dry. Marinate the fish. Put the 3 chopped green onions, chile, the 1-inch piece of finely chopped ginger, the Chinese cooking wine, soy sauce and the black pepper into a blender and buzz to combine. Pour the mixture into a glass or plastic container, or a Ziploc bag. Add the Sichuan peppercorns, if using. Place the fish in the container and make sure the marinade surrounds the fish. Let this sit in the fridge for 30 minutes to 3 hours. 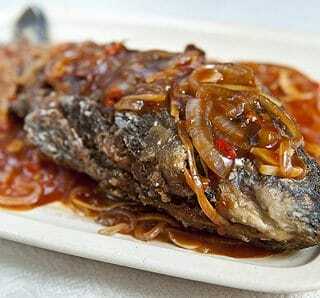 When you are ready to cook the fish, take it out of the fridge to come to room temperature. Prepare the vegetables. Julienne the 3-inch piece of ginger. Keep in mind 3 inches is a guideline, so the ginger can be a bit larger or smaller. Cut the ginger into a rectangle, then slice it into thin rectangles about 1/8 inch thick. Then slice these thin rectangles into very thin strips -- as thin as you can make them. Slice the 1/2 onion into very thin half-moons. Slice the garlic cloves as thinly as you can along the long side of the clove to make long pieces. Pour the oil into a wok and turn the heat on to medium-high. If you do not have a wok, use the largest, deepest skillet you have. A wok really matters here, though, as its shape prevents the tail fin from burning to charcoal. Meanwhile, make the sauce. Mix the tomato sauce -- I use pureed tomatoes -- sugar, soy sauce, Chinese cooking wine, water and corn starch and stir vigorously to combine. Set it aside. Check the oil temperature. You want it to be about 325°F. If you do not have a thermometer (you should buy one!) the oil is ready when a drop of flour tossed into the oil sizzles immediately. Fry the fish. Remove the carp from the marinade and dredge in flour. Shake off excess, and when the oil is at hot, slip the fish one at a time into the oil. You are probably going to have to cook one fish at time. If so, turn the oven on to "warm." Fry the fish for at least 5 minutes per side. You want it to be golden brown. I will fry a 1-pound fish for 8 minutes on the first side, 5 minutes on the other side. Larger fish will need more time. 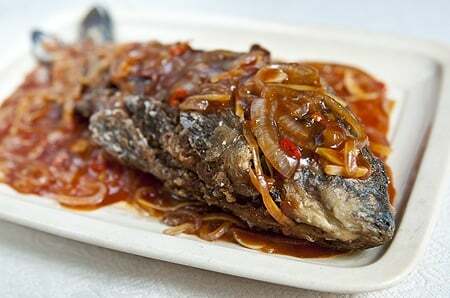 When the first fish is done, remove it to a plate and put the plate in the warm oven. Fry the second fish the same way as the first. Finish the dish. When the fish are done, ladle out all but about 1/4 cup of oil. Toss in the slivered ginger, the onion, the chiles and the slivered garlic and stir-fry over high heat for 2 minutes. Add the sweet-and-sour sauce and stir well to combine. Bring this to a rapid boil and stir well. Cook for 2 minutes. You mentioned ‘properly farmed’ carp, would you eat one out of a muddy lake? I was blown away by the amount of carp I saw served in Easten Europe and at their fish mongers. Makes me consider trying it and our local mud hole is FULL of carp. Awesome website!! Christopher: I would eat one our of a muddy lake… if the water was at least cool. Carp in warm water get very mushy.